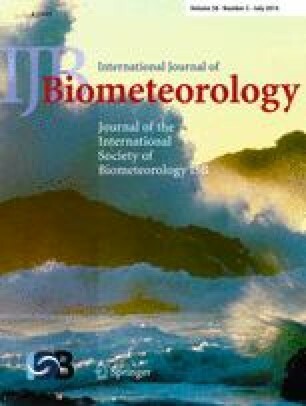 Climatic change is expected to affect the spatiotemporal patterns of airborne allergenic pollen, which has been found to act synergistically with common air pollutants, such as ozone, to cause allergic airway disease (AAD). Observed airborne pollen data from six stations from 1994 to 2011 at Fargo (North Dakota), College Station (Texas), Omaha (Nebraska), Pleasanton (California), Cherry Hill and Newark (New Jersey) in the US were studied to examine climate change effects on trends of annual mean and peak value of daily concentrations, annual production, season start, and season length of Betula (birch) and Quercus (oak) pollen. The growing degree hour (GDH) model was used to establish a relationship between start/end dates and differential temperature sums using observed hourly temperatures from surrounding meteorology stations. Optimum GDH models were then combined with meteorological information from the Weather Research and Forecasting (WRF) model, and land use land coverage data from the Biogenic Emissions Land use Database, version 3.1 (BELD3.1), to simulate start dates and season lengths of birch and oak pollen for both past and future years across the contiguous US (CONUS). For most of the studied stations, comparison of mean pollen indices between the periods of 1994–2000 and 2001–2011 showed that birch and oak trees were observed to flower 1–2 weeks earlier; annual mean and peak value of daily pollen concentrations tended to increase by 13.6 %–248 %. The observed pollen season lengths varied for birch and for oak across the different monitoring stations. Optimum initial date, base temperature, and threshold GDH for start date was found to be 1 March, 8 °C, and 1,879 h, respectively, for birch; 1 March, 5 °C, and 4,760 h, respectively, for oak. Simulation results indicated that responses of birch and oak pollen seasons to climate change are expected to vary for different regions. This research was funded in part by USEPA under STAR Grant EPA-RD-83454701-0 (PI: L.B., MD) to Rutgers University and UMDNJ, and by the NIEHS sponsored UMDNJ Center for Environmental Exposures and Disease at EOHSI (P30ES005022). We also wish to thank Dr. Ruby Leung (PNNL), Dr. Alan Robock (Rutgers), and NARCCAP for providing the meteorology data, AAAAI for providing airborne pollen data, and Ms. Linda Everett and Zhongyuan Mi (EOHSI) for editorial assistance.